Management of unstable proximal humeral fractures has remained controversial since ages. 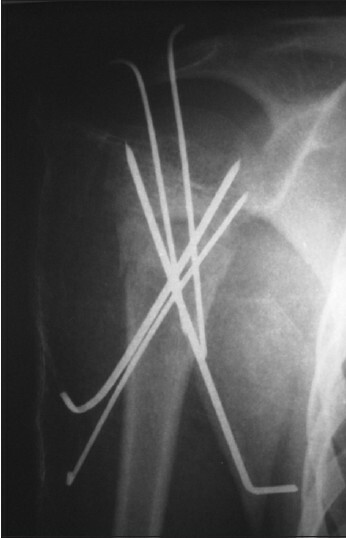 Open reduction and internal fixation have resulted in devastating complications like stiffness of shoulder joint, avascular necrosis, infection, etc., We are presenting a novel method of percutaneous pinning of unstable proximal humeral fractures. All cases (32) were done closely without soft tissue stripping. All cases were followed-up for a period of 3 years; and results were assessed according to 100 point constant score. A total of 75% cases showed excellent to good results. To minimize the complications like pin site infection, loosening, neurovascular damage we used fixed pin site insertion technique, and threaded pins in osteoporotic patients. So percutaneous pinning is a safe and novel method of management of unstable proximal humeral fractures if certain principles are borne in mind before using it. Proximal humerus fractures constitute 5% of all appendicular skeletal injuries  and are mainly a menace of the elderly. Hence, most of these fractures (80%) are amenable to nonsurgical treatment either because they are undisplaced and stable or because elderly people tolerate minor deficiencies in reduction much better. It is the management of remaining 20% displaced and unstable fractures that remains elusive to the surgeons. There is no dearth of options available for the fixation of these fractures, reflected from the fact that Sporer et al., described 10 different methods for a single fracture type, but none of the techniques have proved to be ideal and consensus still seems far-fetched. The conservative management in the form of simple immobilization puts shoulder at the risk of stiffness and malunion, ,,, transosseous suturing fails to provide a rigid construct, intramedullary nailing violates the rotator cuff predisposing to postoperative shoulder pain, open reduction, and fixation with plates endangers the neurovascular structures and increases the likelihood of osteonecrosis of humeral head, and even hemiarthroplasty , in the hands of other surgeons has not been as rewarding as reported by Neer. ,, A novel method of biological fixation by closed reduction and percutaneous pinning is actually an extrapolation of original Bohler's , technique described in 1962 for epiphyseal fractures of proximal humerus. Some minor complications and limitations of this technique are masked by the overwhelming advantage it offers, which are a rigid fixation without sacrificing soft tissues and vascularity around the head, lower rates of avascular necrosis, decreased scar formation, and better cosmesis. We present our experience with this method. The study was conducted at Lady Hardinge Medical College and Dr. Ram Manohar Lohia Hospital between 2010 and 2013. All the suspected cases of proximal humerus fractures presenting to us within 10 days of trauma were subjected to radiography (anteroposterior (AP) and axillary view) and if required computed tomography, to diagnose and to classify them using Neer's classification. With adequate preparation for possible open reduction, all the fractures were given an initial trial of closed reduction which if attained as per Neer's , guidelines (<1 cm displacement, <45° angulation), was secured with percutaneous k-wires. Only when closed reduction was not possible due to severe communition, fracture-dislocations, anatomical neck fractures, and head-splitting fractures; as we experienced in seven of the 39 patients during the study period that the subjects were excluded from the study and alternative intervention was resorted to. Thus, our study finally included 32 patients (22 females and 10 males) with a mean age of 52.2 years with fractures of proximal humerus (20 left humerus and 12 right humerus) treated with closed reduction and percutaneous pinning. There were 13 two-part, 12 three-part, five four-part fractures along with two fracture dislocations. At the final follow-up at 3 years the results were assessed according to the 100 point constant score. The subjective assessment (35 points) includes a single item for pain (15 points) and four items for activities of daily living (work 4, sport 4, sleep 2, and positioning the hand in space 10 points). The objective assessment (65 points) includes: Range of motion (forward elevation, 10 points; lateral elevation, 10 points; internal rotation, 10 points; and external rotation, 10 points) and power (scoring based on the number of pounds of pull the patient can resist in abduction to a maximum of 25 points). This instrument is weighted heavily on range of motion (40%) and strength (25%). The results can also be graded as excellent, good, fair, and poor depending on the score difference of <11, 11-20, 21-30, and >30 between normal and abnormal side, respectively. The roentgenographic results were evaluated for maintenance of reduction, pin position, osteonecrosis of head, etc. The patients were kept supine under general anesthesia in such a way that the affected shoulder was clear off the table and could be imaged with a C-arm machine. It was achieved by either a beach chair or using a sand bag under the scapula and by keeping the C-arm base at the head end of the patient. Along with 2.5 mm threaded k-wires, 4 mm cannulated cancellous screws and proximal humeral anatomical plates were also made available beforehand. A trial reduction to confirm the feasibility of closed reduction and fixation was done before final sterile preparation and draping. The maneuvre included longitudinal traction in slight abduction and flexion of the arm to relax the pull of pectoralis major muscle, followed by posterior pressure on the humeral shaft to correct the angulation or anterior displacement of the shaft in relation to head. The reduction was confirmed under C-arm and if satisfactory, sterile part preparation was done for pinning. The ideal starting point for lateral pins which is at least twice the distance from the top of the humeral head to the most inferior margin of the articular cartilage [Figure 1], ,, but not distal to the deltoid tuberosity (to protect radial nerve) and the ideal angle of insertion so that the pin enters the center of the head, were determined by placing the k-wire over the skin and confirming with image. This also protects the axillary nerve which lies at an average distance of 5 cm distal to acromion. The trajectory to be followed was marked on the skin, a stab incision was given over the predetermined starting point on lateral side of arm, soft tissues was retracted using artery forceps, a 2.5 mm threaded k-wire was placed directly over bone along with a sleeve under C-arm guidance and advanced in to the bone initially at a horizontal angle to prevent skating off of the pin and gradually approximating to the predetermined angle. The pin was oriented posteriorly to match the normal retroversion of around 20° of the humeral head and was advanced up to the subchondral bone. ,, The pin placement and reduction was confirmed at this point in both AP and axillary views with the C-arm, and a second pin was inserted parallel to the first one so that they were separated by at least 1.5-2 cm in the head. The third pin was inserted from the anterior cortex through a stab incision protecting the long head of biceps. 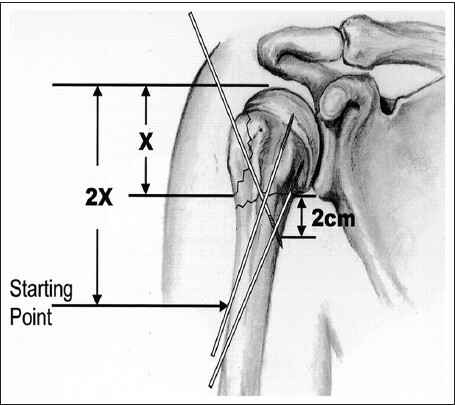 For three-part fractures involving the greater tuberosity (>5 mm displacement), two additional k-wires drilled in a retrograde manner through a properly reduced greater tuberosity towards a point at least 20 mm distal from the inferior extent of the humeral head to avoid injury to the axillary nerve and the posterior circumflex artery [Figure 1]. In cases of four-part fractures also, closed reduction was done and was accepted even with few degrees of malreduction of the shaft to the head segment, but all possible methods (using k-wire as joystick, using hooks, etc.) were employed to anatomically reduce the tuberosities in order to avoid malunion and later blockage of motion. The pins were bent and cut over the skin, antiseptic dressing was applied, and the arm was supported in a broad arm sling. Patients were reviewed in the outpatient department on weekly basis to look for loosening of pins and pinsite infections and serial radiographs were taken to detect early backing out of the pins. K-wires through the greater tuberosity were removed at 3 weeks and gentle pendulum exercises were started. The remaining pins were removed at 6 weeks, when early signs of radiographic union became visible so that more aggressive physiotherapy could be started to regain shoulder range of motion. Thirty-one of the 32 patients were available for clinical and radiological evaluation. There were 22 females and nine males in the study with the mean age of 52.2 years with 13 two-part fractures (including three greater tuberosity fractures, two anatomical neck fractures, and eight surgical neck fractures), 12 three-part fractures, four four-part fractures, and two fracture dislocations (anterior dislocation with greater tuberosity fracture). One male patient with four-part fracture died of non-associated reasons at 3 months postoperatively. Out of 31, 21 patients had a constant score of over 90, six had scores of over 85, and rest four had scores below 80. Also, 24 patients were graded (compared to normal side) as having excellent or good results, five having fair, and two patients having poor results. Those who had poor results had low constant scores of 64 and 62, mainly due to limited strength of abduction and subjective decrease in the level of activities. Five patients with fair results had somewhat lesser range of motion than normal, with three of them having mild shoulder pain as well. Fracture dislocations behaved much better than expected, once we were able to reduce them, and they had constant scores above 90. It was the improperly reduced tuberosity of two-, three-, and four-part fractures that lead to decreased movement (abduction and internal rotation) and activity and hence low constant scores. Surgical neck fractures were better than anatomic al neck fractures and had good to excellent results. All the fractures united by 8 weeks on average, though malunion of tuberosities and neck was observed which accounted for poor results [Figure 2], [Figure 3], [Figure 4]. Minor displacement of reduction within acceptable limits was seen in six cases, but few other cases (six) had complete loss of reduction with backing out of k-wires due to pin tract infection (four), inadequate pin positioning (three), and too much osteopenic bone (two). All the six displacements were detected within 2 weeks and were corrected in time to give good to excellent results at final follow-up. None of the patients had deep infection or loss of reduction after second procedure, but one four-part fracture was suspected to have asymptomatic subtotal osteonecrosis of femoral head which we managed conservatively [Table 1]. Final range of motion and hence results were more dependent on the proper reduction of tuberosities and allowed malreduction of other fragments over a wide range. Although percutaneous pinning may be biomechanically less stable, but certain methods may enhance this stability. These are using pins with larger diameter and terminally threaded pins which have a strong hold on opposite cortices and configurations with biplanar fixation. Pin configuration has also been studied. Parallel pin configuration was biomechanically superior to convergent pins. There was some delay in fracture union where process had to be revised due to pin migration, but the final result was unaffected. Pin migration (10 out of 31 patients) was the main complication and was secondary to infection, poor bone quality, and poor technique. Though leaving the pin over the skin could be the cause of infection, it was not significant enough and preventable with due care, and it is much easier to remove such protruding pins than the buried ones. What could be improved upon, to prevent k-wire loosening, is the pinning technique. All fractures need to be fixed with a minimum of three k-wires including one anterior pin, and 2 k-wires should be added if greater tuberosity is also displaced. The k-wires should be threaded and should have proper hold in the subchondral bone (lateral pins) or the opposite cortex. They should be widely spaced in the fragments and too medial placement of lateral pins should be avoided. Achievement of full range of motion was also delayed in patients who did not comply with physiotherapy and poor rehabilitation produced poor results. There was no association between the final result and the age of the patient or the severity of the fracture. Finally, though the learning curve for closed reduction and percutaneous pinning is steep, it is quite worth. Surgeons should avoid open reductions as much as they can and should attempt this technique in two-part fractures to start with and gradually applying it to all other proximal humerus fractures. 1. Court Brown CM, Caesar B. Epidemiology of adult fractures: A review. Injury 2006;37:691-7. 2. Sporer SM, Weinstein JN, Koval KJ; The geographic incidence and treatment variation of common fractures of elderly patients. J Am Acad Orthop Surg 2006; 14:246-55. 3. Neer CS II. Displaced proximal humeral fractures. J Bone Joint Surg 1970;52-A: 1077-103. 4. Neer CS II. Fractures about the shoulder. In: Rockwood CA, Green DP, editors. Fracture in Adults. Vol 1, 2 nd ed. ; 1970. p. 675-721. 5. Kristiansen B, Kofoed H. Transcutaneous reduction and external fixation of displaced fractures of the proximal humerus. J Bone Joint Surg 1988;70:821-4. 6. Bohler L. The treatment of fractures. 5 th ed.. New York: Grune and Stratton; 1956. 7. Nanda R, Maiya MA, Goodchild L, Finn P, Regen A. Constant and oxford scores in conservatively treated proximal humeral fractures. J Bone Joint Surg Br 2005;87-B. 8. Jaberg H, Warner JJ, Jakob RP. 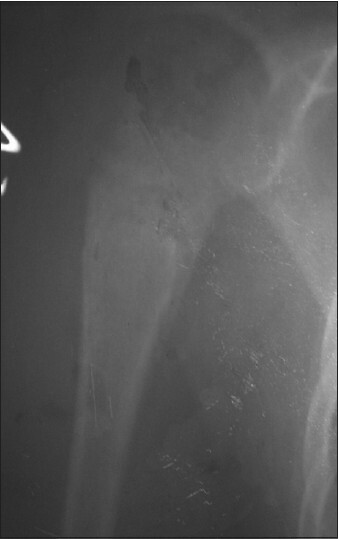 Percutaneous stabilisation of unstable fractures of humerus. J Bone Joint Surg Am 1992;74:508-15. 9. Rowles DJ, McGrory JE. Percutaneous pinning of the proximal part of the humerus: An anatomic study. J Bone Joint Surg Am 2001;83:1695-9. 10. K amineni S, Ankem H, Sanghvi S. Anatomical consideration for percutaneous proximal humerus fracture fixation. Injury 2004;35:1133-6. 12. Hagg O, Lundberg B. Aspects of prognostic factors in comminuted and dislocated proximal humerus fractures. In: Surgery of the Shoulder. p. 51-9. 13. Sturzenegger M, Fornaro E, Jakob RP. Results of surgical treatment of multifragmented fractures of the humeral head. Arch Orthop Trauma Surg 1982;100:249-59. 14. Magovern B, Ramsey ML. 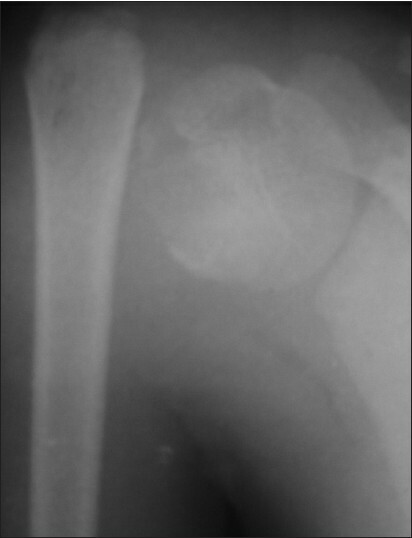 Percutaneous fixation of proximal humeral fractures. Orthop Clin North Am 2008;39:405-16.